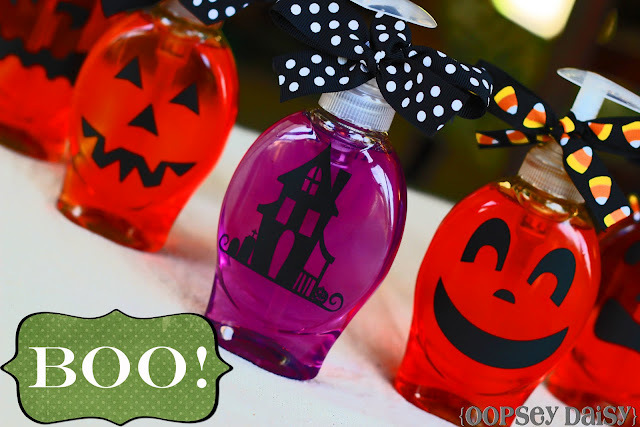 In case making your own Halloween soap isn't in your current skill set (or you just don't want to buy all of the supplies to give it a whirl, Alsion created these fun Halloween liquid hand soap dispensers that will be just as fun for decorating your wash room for Halloween. If you don't have a cutting machine to just out vinyl, you could always use a template and paper with a little decoupage or even just a good old fashioned sharpie. You can check out these Halloween hand soaps over at Oopsey Daisy.